As a child, I had many pets. Pet ownership was something that was ingrained in my family’s life since before I was born. We have always all been animal lovers and I grew up in an environment with animals aplenty. We had dogs, hamsters, cats, fish, turtles, birds, and even some iguanas. My favourite of all of my pets were the dog, and the cat. The cat was mine alone; my mom got her as a mousing cat when we lived on a large, rural property on my final day of kindergarten and she chose me as her favourite human. Before long, I was the one responsible for feeding her, changing her litter box, and making sure she slept inside instead of stayed outside all night roaming the neighborhood. The dog just provided hours of entertainment, from playing with her to grooming her and ensuring she was fed and had water. Pets are a lot of work, that’s for sure. They require a lot of attention, so they aren’t for everybody. Some people don’t like animals, and some have busy careers that wouldn’t allow for pets. However, I do think that pets are great for children, and can provide a lot of benefits to your child and family as a whole. Studies have shown over and over again that those children who grew up with pets have higher levels of empathy and compassion. There are certainly other ways to teach your children these things, but caring for an animal who is powerless without you can be a powerful lesson. One of the biggest reasons many people decide to get a pet for their child is to teach them some responsibility. Pets can be a lot of responsibility, and this can be an effective, hands-on approach to teaching your child a little bit about it. A common issue when this is the case, is that the children will lose interest in the pet quickly, leaving their parents to take after the pet and the children, which is a lot to handle. That can be the flip side of the coin, but if you ensure that the responsibility of the pet is shared, it can be quite effective. In a ever more digital world, children are getting less and less exercise. Studies show, however, that pet owners get far more exercise than their non-pet owning counterparts. Pets (dogs, and larger animals in specific) require a lot of activity and exercise to stay healthy and stimulated, and so do you (we just sometimes cheat ourselves out of it). If you can designate walking the dog as your child’s job, you will be setting him up for success when it comes to being active and physically fit; even better if he or she plays sports and is generally active on top of that. 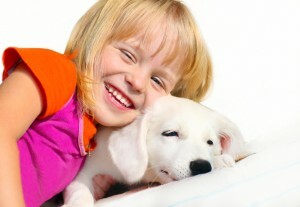 Pets are often considered best friends of children. They protect, help, and comfort people of all ages, but children seem to be more in-tune with their ability to be a great companion. There are quite a few studies that link pet ownership with more stable mental health, fewer instances of anxiety, and a variety of different emotional benefits, and it makes sense; when you are lonely, your pet is always there. They are great listeners and keep you engaged in something other than your own emotions. I don’t have children, but have worked with animals since I was 15. I have a passion for animals and believe that they can provide benefits to people from all ages and walks of life. Owning a pet isn’t for everybody, but it’s very rewarding to do! I have a friend who had pets growing up but hates animals now. It’s rare but it happens! Ha ha, yes, you have to be able to commit to pets for the long term which isn’t possible for everyone. Love this! I hope our future kids will learn these lessons from owning Frugal Hound–I know she’s certainly taught my husband and I plenty! Frugal hound is so cute! I was always begging for some kind of pet when I was a kid. I had a whole variety over the years, especially those with my two cats. I’ve been thinking about getting a cat, but now just doesn’t feel like the right time. Maybe next year if my job quiets down. Yeah, pets are a commitment, that’s for sure! Labusky is a creative name, haha. Your daughter is lucky to have the opportunity to care for an animal!